I love serving red pepper jelly over a block of softened cream cheese for gatherings. It’s always been a favorite of mine and my guests. But I also like to use it as a glaze for shrimp, salmon and ham. I change it up with cayenne pepper, soy sauce, teriyaki sauce, and fresh herbs, depending on the flavor I want. But the base is always about 2-3 tablespoons of the jelly and 1-2 teaspoons of olive oil. 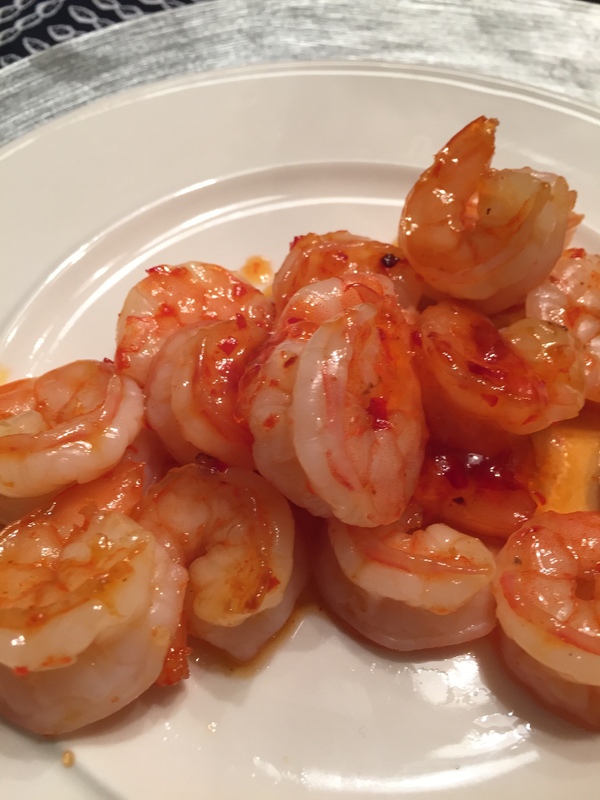 I served this shrimp over a bed of brown butter and turmeric orzo. And I added another teaspoon of the jelly as a topping on the shrimp while it was still hot from the oven. 1. Rinse shrimp and dry, place in a bowl. 2. In a separate bowl add the remaining ingredients and blend well. 3. 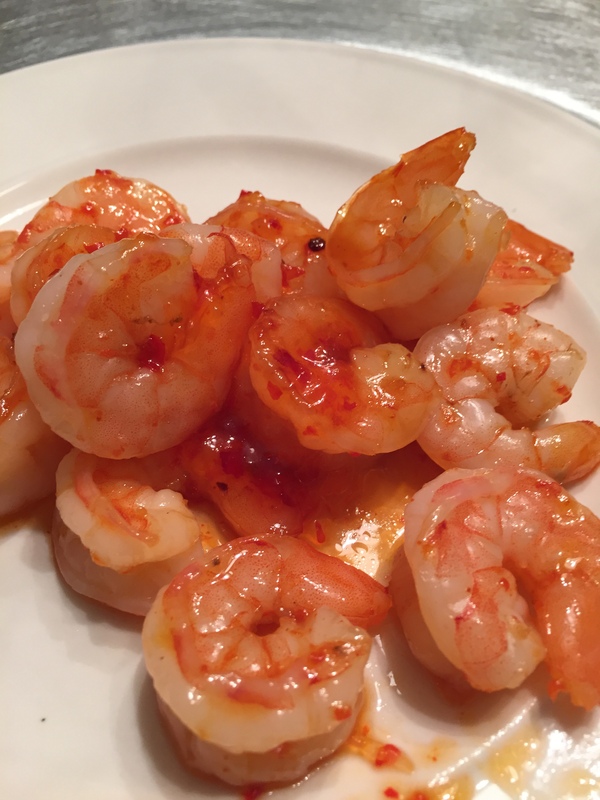 Pour red pepper jelly over shrimp and toss to coat. 4. Spread evenly on a cookie sheet and bake for about 10 minutes. Halfway through, remove cookie sheet and toss shrimp and put back in the oven to finish cooking. 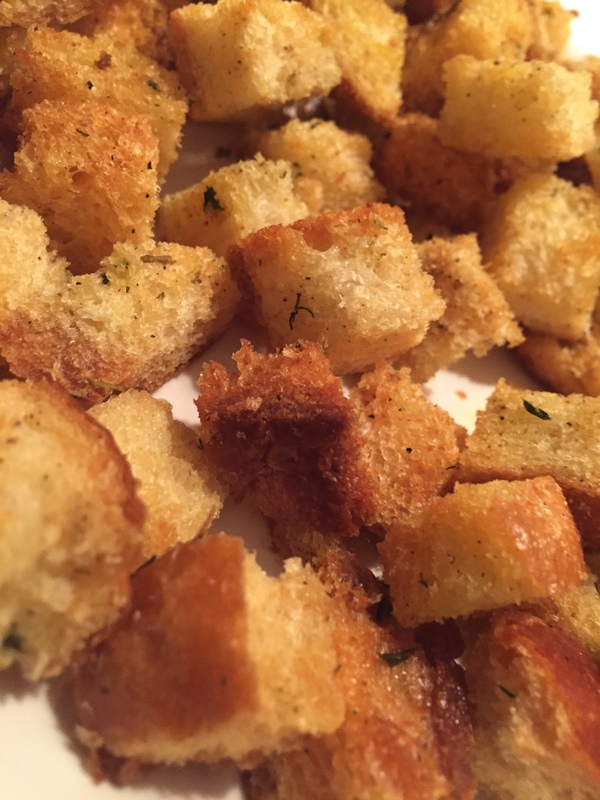 If you have never tried making your own croutons, you really need to because they are so easy! Not only are they super simple to make but they taste better than store bought and you can play around with spices and herbs. 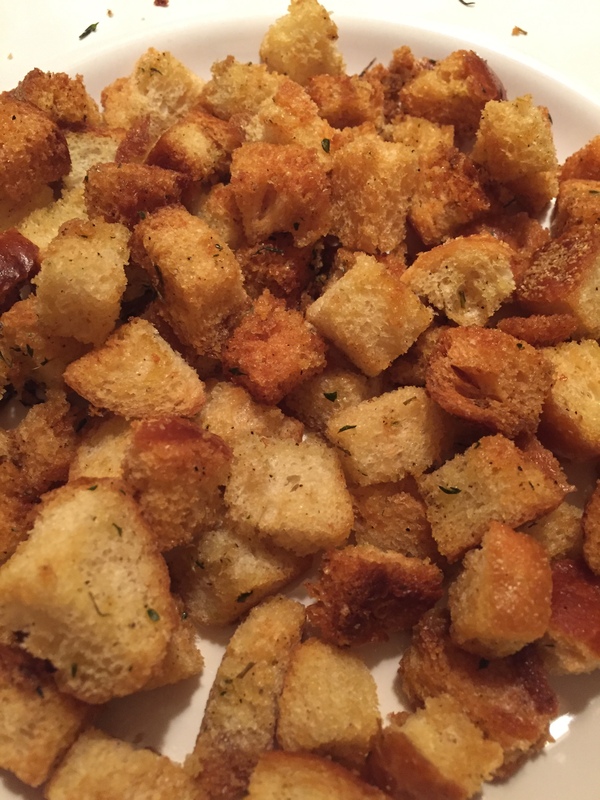 And another great thing about homemade croutons is that they are not as HARD as rocks as store bought!! Unless you really do like them that way…. You can use whatever type of bread you have on hand or left over. Even the pre-sliced sandwich bread can work. It’s a great way to use up left-over bread or bread that is going stale. 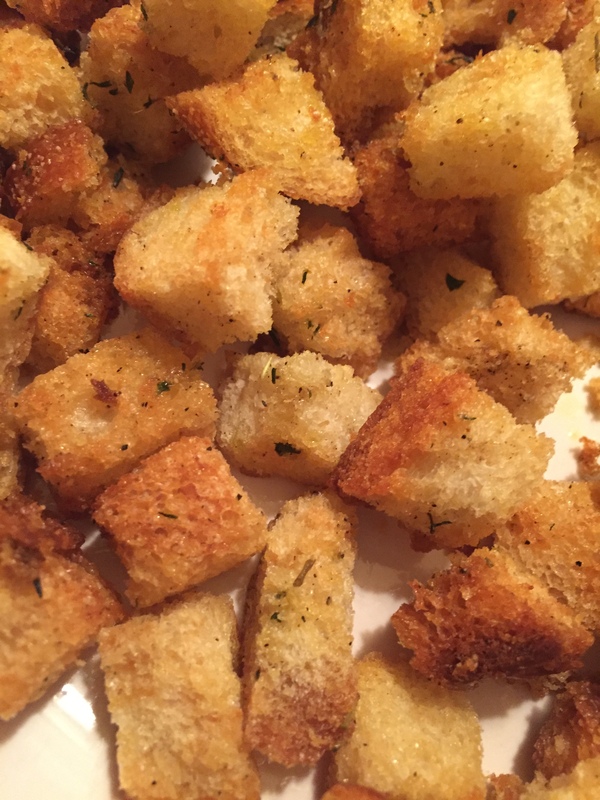 Whenever I have leftover bread, I either freeze it for later or I immediately make croutons. I like to slice the bread and then cut into cubes and toss them into a bowl. Mine are about ½ inch to ¾ inch squares. Drizzle the bread cubes with olive oil. Sprinkle with a good amount of salt and pepper. Toss well. Here is where you can start to experiment with spices and herbs. I usually use chopped thyme. Try rosemary or chives, a pinch of cayenne pepper for a spicy kick would be fun. If you are serving the croutons over a salad as a side with turkey or chicken, try some poultry seasoning as a compliment to tie the meal together. The recipe listed below is based on leftover bread that I had on hand. You can adjust the ingredients to what you need. When coating the bread cubes with olive oil, just coat them, do not saturate them! I baked mine on a stone baking sheet and it worked fine. Whatever you bake them on, you will need to remove the cookie sheet every few minutes until they are golden and toasted, about 10 minutes. Generous amount of Salt and Pepper. 1. Gently toss bread cubes with the oil to evenly coat. Do not saturate the bread cubes. 2. Add salt, pepper and chopped thyme and gently toss. 3. Spread the bread cubes in a single layer over a parchment paper lined cookie sheet. 4. Bake for about 10 minutes or until toasted, removing every few minutes to toss croutons and/or turn the cookie sheet around in the oven. 5. When toasted and golden remove immediately and transfer to a plate to cool. 6. Store in an airtight container in the fridge. It’s game day! No matter which team you are cheering for, let’s be honest…. the commercials and the game day food are really the highlights of the day! Here are some yummy idea’s from some previous posts. This Cheeseburger Quesadilla is really yummy! Easy to make and you can cut them into smaller slices for easier serving for your crowd. And I can’t forget the Chicken and Avocado Quesadilla. These quesadillas can be made earlier in the day and reheated in the oven. This Three Cheese Roasted Red Pepper Dip is unbelievably good! I haven’t made this lately, but it’s a sure thing for my next gathering. Don’t forget the Taco Dip!! This is just a basic taco dip but it is always a crowd pleaser. Over the years I have changed up the ingredients using black olives, guacamole, various seasonings, chopped roasted red peppers, chopped jarred jalapenos, and chopped onion. This list could go on and on! Enjoy your day and the game!